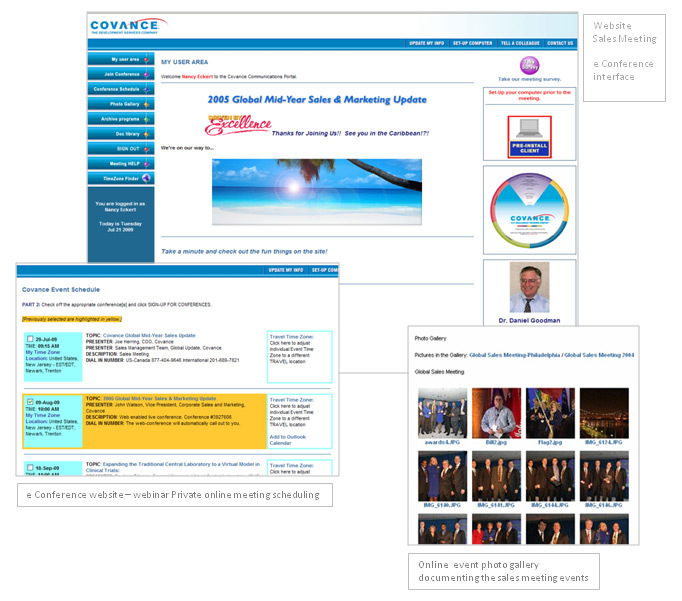 Covance Development – Internet Meeting- Sales update for over 250 International participants. Utilizing their e-Conference interface [custom designed and developed by Birchwood Group], combined with The Birchwood Group’s Events Management Team, we were able to shorten the lead time for Covance’s Global Sales Meeting to less than 30 days! This facilitated the immediacy needed for this important team communication. Customized time zone sensitive private scheduling interface for e-conferences, private gateway through e-conference website with direct coding into WebEx conference room, auto feed of conference schedule, streamed archive of previous programs, Forum for additional Q&A, surveys, photo galleries, auto email notification.